The first question to ask is how did we get here? Cannabis (CBD) is the major non-psychoactive component of Cannabis Sativa L. (Hemp). In 2012, at Tikun Olam, an Israeli Medical Cannabis Facility, a new strain of plant was developed that contained only CBD as the active ingredient and virtually no THC. Hemp plants are selectively developed and grown to contain high concentrations of CBD and very low amounts of the psychoactive component THC. A few CBD manufacturers further purify their products to contain elevated levels of CBD and no THC. With the passage of the 2014 FARM BILL the US Congress differentiated industrial hemp from marijuana plants. This law authorized the growth, cultivation and marketing of industrial hemp in states that have legalized such activities. In 2017 the State of OKLAHOMA passed House Bill 1559 which allowed for Cannabis sativa L. (Hemp) containing less than .3% of THC by dry weight to be shipped into the state. The January Oklahoma State Pharmacy Board News, section 18.08, page 4, specifically allows for the use of purified synthetic derived (Hemp) CBD oil which is completely absent of any THC whatsoever. Why is this so important medically? Simply because the body has a natural endocannabinoid system. 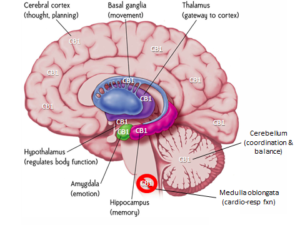 The receptors for cannabinoids; CB1 & CB2 promote balancing for the overall health and wellness of the individual. CB1 receptors are located in the brain, lungs, nerves, muscles, vascular system and gastrointestinal tract. 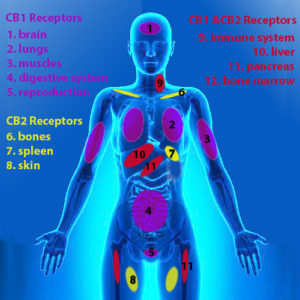 CB2 receptors are present in the immune system, bones, spleen, colon, pancreas and liver. The endocannabinoid system then in turn helps regulate a diffuse series of bodily functions ranging from immunological, involuntary nervous system, gut, central nervous system, bones, muscles, etc. It essentially is a normalization translator for the body. Cannabinoids can provide stabilization and augmentation for many of the physiologic processes which we all need to function optimally throughout the day. From a research perspective CBD has been studied as both an add-on supplement and/or an alternative to narcotics, antidepressants, seizure medications, immune function modulators, movement disorder drugs, and migraine treatments. There is literally no end in sight currently to all its potential uses as a primary or secondary intervention for a tremendous number of medical illnesses. Over the next 5-10 years, as the data matures, we will be able to know with greater specificity how to use CBD more effectively. Currently it is reasonable to consider CBD in one of its various forms including oil (tincture), cream, or capsule for a variety of potential symptoms. It is essential however to use a documented purified CBD completely free of THC and/or pesticides for it to be safe and to remain compliant with Oklahoma law. Many available over the counter products do not meet state law and will contain meaningful concentrations of THC. This can result in a positve drug test with subsequent devastating results. Consumers must by extremely vigilant when purchasing CBD from different vendors. It is much less costly to the retailor to provide impure CBD than a purified version. This is most often inadvertent but the consequences for the individual remain in place. Discussing possible reasons to initiate CBD as a therapy are best discussed with a knowledgeable healthcare provider. Dosing is individual and varies based on the medical issue. In our practice at Optimal Health Associates we have been utilizing CBD as a primary therapy and secondary therapeutic alternative for over 3 months. Its uses have included for neurologic, psychiatric, menopausal, bowel dysfunction, rheumatologic, chronic pain and many other conditions. The results have been meaningful to our patients and thrilled the provider team. 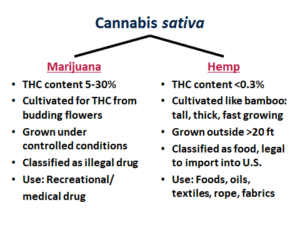 In summary, Cannabis Sativa L. or CBD has arrived in Oklahoma. It can offer potential benefits to address routine, difficult or refractory medical conditions. It must be remembered that not all CBD is truly legal and safe to use. Identifying a purified product, specific to an individual’s needs is essential for an optimal outcome.